Entre Amigos (Among Friends) are a two trombone-led salsa group based in Brooklyn, presided over by the formidable figure of Willie Villegas. A multifaceted individual, besides co-leading Entre Amigos, playing timbales with them and producing their albums, Willie hosts the cable TV show Salsa En La Calle. 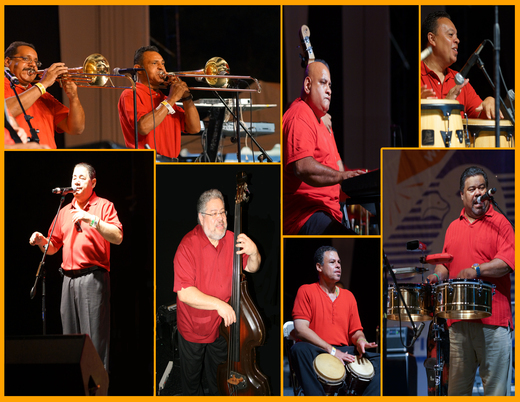 No newcomer to the US salsa scene, Willie has played with such luminaries as Joe Quijano, Joe Cuba, Eddie Palmieri, Frankie Ruiz, Lalo Rodríguez, Tito Puente, José Fajardo and Paquito Guzmán to mention a few. Johnson Morales-Pianist and Co-Leader who gives you an explosive style and originality beyond the normal realm. Fernando Rentas-Bassist sets the foundation and anchors the groove. On bongos giving Entre Amigos that special nostalgic New York style. Gamaliel Bonilla - lead trombonist with a strong sound and bold solos, also sings background vocals. Jose Rivera - 2nd trombonist and Percussionist adds flavor to a tee. Alfredo “Male” Torres - lead vocals takes the challenge of singing with Entre Amigos knowing that at live performances he has to invent new lyrics on the spot with virtually no time to think.